The camp is scheduled for July 22, 2017 at Camp Alexander, Emporia, Kansas. Participation is limited to 20 children. Your application must be submitted by Friday, July 14th. Communication Camp hopes to bring together children with communication challenges to explore their world and improve their communication skills while participating in camp activities. Communication Camp is a collaborative effort between the Emporia Sertoma Club and Camp Alexander along with the support of volunteers from the Emporia area. 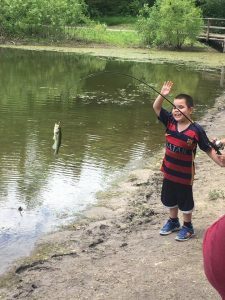 Activities include fishing, water play, hiking, crafts, camp games, and exploring.